Active scripting option is disabled in your web browser. Trash the dress sessions are becoming more and more popular. For most beach destination weddings it seems to be a must; the appeal of a sunset portrait at the ocean's edge is just too much to pass up when in the tropics. I find even here in the Canadian Rockies, brides & grooms are showing interest in a "Day After" portrait session, which isamore linguistically friendly term than "trash the dress". Is a "Day After" portrait session right for you? Here are some of the pros & cons to consider. 1. The experience is worth it. 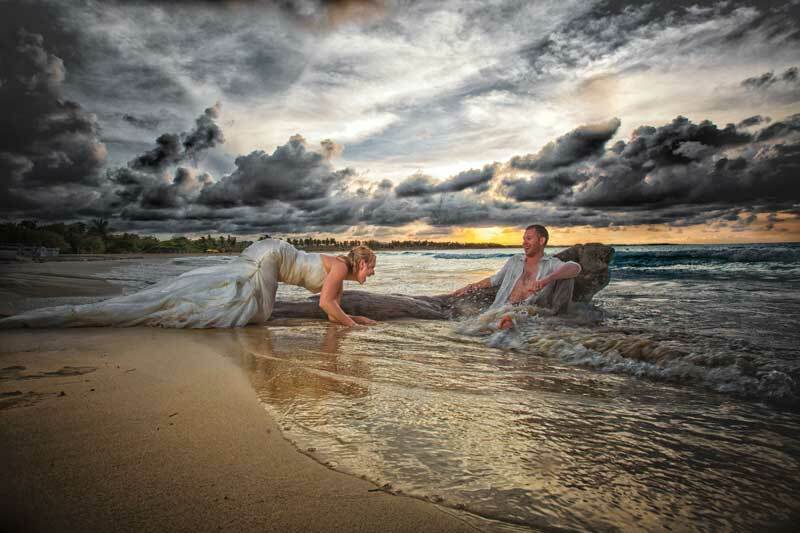 Brides and grooms really enjoy their "Day After" photo session. I've been told by clients that it was one of the most memorable and favorite experiencesof the entire wedding! 2. With the stress of the wedding day over, youcan relax and enjoy the playful vibe of the photo session. I suspect this is why brides & grooms enjoy it so immensely. With their family and friends gone, the happy newly weds finally exhale a sigh of relief and because they are more relaxed, the pictures are often more expressive and authentic of who they are. 3. The photographer is virtually unrestrained in their creativity. Without having to worry about keeping the dress clean, your photographer has free reign to create wedding pictures that are unique and unexpected. These photos may well be worth more to you than the dress. 4. The dress does not have to be "trashed"! Wedding gowns are amazingly robust for such delicate things.After a cleaning, it is often in surprisingly good condition.In fact, salt water is great for removing greasy cake stains, wine and sweat!If you don't go crazy at your photo session, ie. engage in a massive paintball conquest, you can have it cleaned and still save it to pass down to future family members, turn into a quilt, or donate. 5. It's a nice event to look forward to after the wedding. It keeps the magic going and off sets any post wedding blues. 6. You get to wear your dress again, and who doesn't want to do that? especially if they paid for the dress and others who feel that trashing your beautiful wedding gown is a ridiculous and selfish thing to do. 2. Sentimental attachment to your wedding gown may be too high to risk damaging it. It is your WEDDING GOWN after all!A trash the dress session puts the dress in danger of being irreparably damaged.If you are thinking about donating it, saving it for future generations, or reselling the dress you may not have that option if it gets ruined.It's an additional cost to consider. You may be too tired, both physically and emotionally, the day after your wedding to want to have the photo session. Whether you trash your wedding dress with complete abandon in a sublime declaration of liberation that connects you deeply to you new husband or respectfully say "No thank you! ", it's your choice to make. As for me, I love shooting "Day After" sessions. You can have a lot of fun without "trashing the dress". Often the images I create in the session are my clients absolute favorites and some of my signature images. Personally, I couldn't completely destroy my wedding gown as some brides do, but I respect their liberated thinking and wild, poetic abandon. I find it very Buddhist. Like a sand mandala beautiful, yet impermanent. If after reading this article you still can't decide, have your cake and eat it too! You don't have to wear your wedding gown. Pick an inexpensive one up at a thrift store or on-line and wear that one instead.